This video is all about shot making. 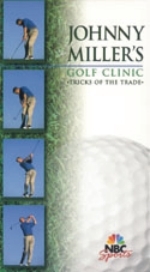 Learn how to curve the ball and control its trajectory. Johnny's instruction breaks away from conventional instructions that teach mastering one swing and then making small adjustments. In this video he teaches you to play with a variety of swings. Learn to play like the pros. Johnny Miller is not just a legend, he's a great teacher.